If you are not participating with us in the parade, come out and cheer us on. 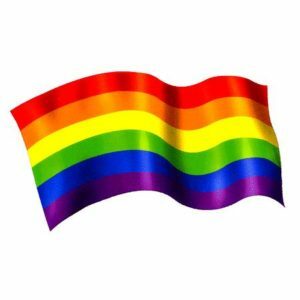 Parade begins at 10:30 a.m.
Those who are in the parade with our float, meet at the Brick parking lot at 8:30 a.m. wearing bright colours (tropical theme) and bring a colourful umbrella if you have one. Come and celebrate our first entry in the BVJ Parade! All are welcome. Come help us plan our exciting fall events. 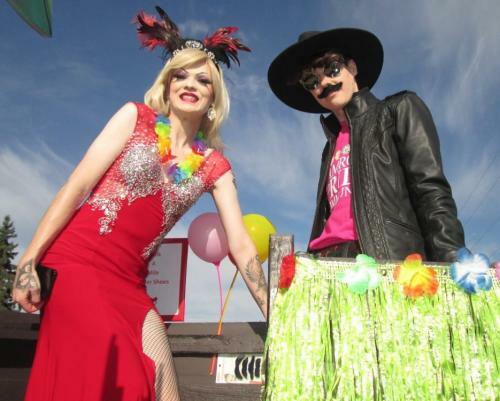 Would you like to be on the Camrose Pride Community Float in the Big Valley Jamboree Parade on August 3? Wear bright colours and if you have a rainbow umbrella, bring it. Meet at the Brick Parking Lot at 8:30 a.m.
Judging is at 9:30 a.m. The parade commences at 10:30 a.m. There will be a potluck BBQ at Gus’ house in his garden in the evening of August 3 at 6:30 p.m. (5811 41 Ave Close). Burgers will be provided. Please bring other food to share. The donations have not yet been tabulated. Happy to have Bruce Hinkley, MLA and Bill Sears, City Councilor, in attendance at our BBQ again this year! Great to visit with all the people who came to the BBQ; freedom to visit because Rebecca and her family were taking care of the food; such a great help! Thank you also to all who helped in big ways and small for the event! Bruce Hinkley, MLA for this constituency, will be riding with us on the float (other MLAs as well). Jen will send out an email to confirm people’s participation in the parade because we must communicate our numbers to the organizers. Invite others to walk with us in the parade and let Jen know. The Auto Shoppe is at 4709 – 36 Street. Summer Campfire Event at the Ferintosh Manor Bed and Breakfast Bryan will determine a date for the latter part of August. Potential Collaborations: There is potential with the Filipino Community who have been invited to walk with us in the parade. This second issue will be 25 pages long, an increase from 14 pages for the first edition; sales have been going well. Anarqueers is available for purchase at Quantum Comics. July 17 at Alice Hotel Restaurant 5:00-6:30 p.m.